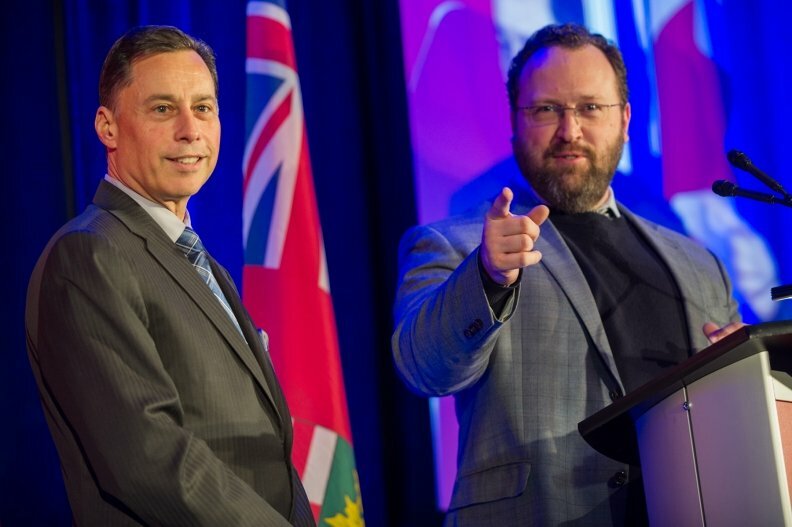 Automotive Parts Manufacturers Association President Flavio Volpe, right, says his association and the provincial and federal governments must get U.S. lawmakers to understand how much Canada means to the auto industry. Canada's auto parts industry is taking stock of Canadian companies that have operations in the United States. The goal is to let U.S. lawmakers know just how integrated the North American automotive industry is as the future of NAFTA remains in doubt. The Automotive Parts Manufacturers Association is conducting a survey it calls Measure of Canadian Companies Having a U.S. Manufacturing Footprint.” Its goal is to determine how many facilities Canadian companies operate in the United States, the number of Americans they employ, and in which U.S. electoral districts those plants are located. “Not only will your submission assist our efforts, but it will also assist your company as we take the aggregate State statistical information to Washington and remind individual congressional representatives that while companies in their jurisdictions may be Canadian owned, the jobs created are American (voters),” the APMA says on its note to members. The information will help ensure that healthy trade relations between Canada and the United States stay strong. Volpe said the association is “in the mid-stages” of completing the survey, which comes before the expected renegotiation of NAFTA. The U.S. Congress has also mentioned the possibility of a border tax on goods entering the United States. “Any policy instrument you’re going to use that you think will benefit the U.S. market only, or any punishing aspects of policy like a border adjustment tax, will affect consumers in all three countries, but also employers in all three countries,” Volpe said. Volpe described the point of the survey as more eye-opener than threat. Volpe didn’t estimate how many facilities Canadian companies operate in the United States; that’s the point of the survey. But, he did say there are factories in some U.S. municipalities “you’ve never heard of” and that they are, in some cases, one of the biggest employers in town. Volpe said the typical Canada-U.S. automotive story is about U.S. investment in Canada, especially post-war. Volpe knows there will be critics who frown on Canadian companies investing in the United States rather than here at home but he said the Canadian market for auto parts has been “shrinking or on hold since about 1998.” Automakers have been closing, not opening, Canadian assembly plants for about the last 20 years.